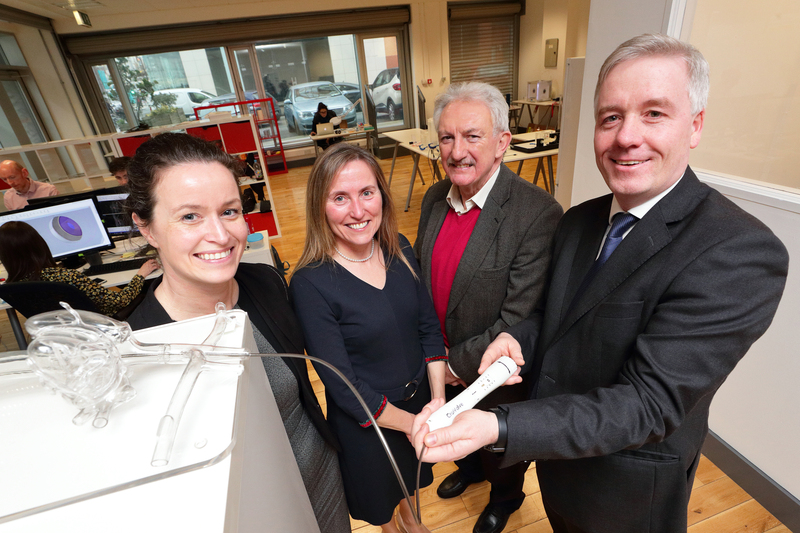 Dublin, 28th March 2019 – CroíValve, an Irish medtech start-up providing a safe and effective treatment for tricuspid regurgitation, today announces that it has secured €3.2 million in an oversubscribed seed financing round. The round was led by the HBAN (Halo Business Angel Network) MedTech and Irrus Syndicates, alongside Atlantic Bridge University Fund, Enterprise Ireland, SOSV and a group of cardiologists who see the treatment’s transformative potential. The funding will support the continued development of CroíValve’s innovative technology. The funding round was led by 48 angel investors from HBAN, the all-island organisation responsible for the promotion of business angel investment, and an initiative of Enterprise Ireland, InterTradeIreland and Invest Northern Ireland. It is the largest ever number of HBAN members to contribute to one funding round and together they invested €1.5M in the company. CroíValve, a spinout from the Trinity Centre for Bioengineering, has developed a minimally invasive treatment for tricuspid regurgitation (TR). The heart condition occurs when the leaflets or cusps of the tricuspid valve – the valve separating the heart’s right ventricle and right atrium – fail to close properly due to dilation of the right heart, allowing blood to leak backwards into the right atrium. This causes further expansion, and eventually failure, of the right side of the heart. It is a severe cardiac disease with progressive symptoms including fatigue, fluid retention leading to abdominal and ankle swelling, liver and kidney failure, and death. As the vast majority of patients are elderly and too frail for open-heart surgery, the only option available to them is medication that removes the excess fluid but does not cure the condition. CroíValve’s innovative technology specifically addresses the challenges associated with tricuspid heart valve disease. The device is delivered through the heart’s blood vessels and seals the gap between the native valve leaflets, therefore restoring the heart’s function and preventing regurgitation. The device is held in place with a unique anchoring system that removes the need for potentially traumatic anchoring into the right heart. The procedure is safe, simple and effective. With over half-a-million new cases annually in the US and EU alone, it is a significant unmet need and market opportunity. Dr Lucy O’Keeffe, CEO, CroíValve, said: “To date, all treatment options are either too invasive or merely symptom management. CroíValve was established from a desire to bring a new, safe treatment option that can change and save lives. “On behalf of Atlantic Bridge, I am pleased to welcome Trinity spin-out CroiValve to the University Bridge Fund portfolio and am also delighted to join the Board of the Company. We believe the CroiValve team has developed a truly novel device that represents a disruptive approach to the treatment of tricuspid valve regurgitation and is an excellent example of the commercialisation of ground-breaking Irish research.” said Helen Ryan, Senior Advisor, Atlantic Bridge. A spin-out from Trinity College Dublin, CroíValve (croí is Irish for heart) is a privately held company that is developing a percutaneous TR treatment option. Dr Martin Quinn, a consultant cardiologist, developed the concept when recognising the clear unmet clinical need. This was further developed, with the support of Enterprise Ireland and EIT Health, within Trinity College Dublin when Prof Bruce Murphy, Dr Lucy O’Keeffe and Dr Paul Heneghan joined the team. The company is located in the Liffey Trust Enterprise Centre in Dublin, Ireland. Atlantic Bridge has €750m assets under management and invests in high growth technology companies globally and accelerates the scale up of companies by applying its proprietary Bridge Model into the US and Chinese markets. The Firm has investment teams, offices and extensive networks in Dublin, London, Palo Alto, Muscat and Beijing. Atlantic Bridge’s €60m University Fund is focused on accelerating the commercialisation of ground-breaking research and the scaling of global businesses from Trinity College Dublin (Trinity), University College Dublin (UCD) and all third level research institutions. The Fund was initiated in a joint leadership collaboration between UCD and Trinity in 2015, with further support from European Investment Fund, Enterprise Ireland, Bank of Ireland and AIB. To date it has invested in over 15 companies including Proverum Medical, Neurent Medical and Atlantic Therapeutics. Irrus Investments is a group of investors, operating in a syndicate, who are primarily interested in early stage investments in new innovative technologies with strong IP and international scalability. The founding members have extensive successful investment, turnaround and international business experience. Irrus expects that its commercial experience allied with its financial investment will combine to accelerate commercial success. Irrus membership is by invite only and brings together individuals with an appetite for investment and experience in a broad range of disciplines and industries. The syndicate has invested €15m over the last 7 years in 16 start-ups primarily in the Life Sciences sector. These companies in total raised €73m. This article was originally published by HBAN.